Goodbye boring breakfast toast, hello fancy indulgence! Photo by Brenna Arnesen. And now, a movie scene, concerning the luxury of toast…. Kate and Leopold, Miramax Pictures, 2001. Kate & Leopold may not have been my favorite Meg Ryan chick flick (trust me, it wasn’t! ), but you do have to agree with Hugh Jackman’s sentiment here… that our lives should not be measured by how efficiently we completed tasks; rather, its quality and richness is derived from the slowing down and enjoyment of color, depth, texture, flavor. I like this thought, and this is why I purposely make cooking a hobby and priority in my life: it’s important. Until we slow down and show our food a little more reverance in its preparation and savoring, we will forsake our health, quality of life, and enjoyment of life. It was this thought of warm, oozing, pleasurable toast that led me to trying a couple of fun different toast combinations. I actually don’t eat much sandwich bread anymore… when we buy bread we get the kind without preservatives, but since we can never finish a loaf that fast, it always starts spoiling and we can’t finish it. Probably best for a couple of daily desk-dwellers to not be so heavily reliant on bread, but we do have it a little bit. These toast recipes are for when you’ve got a fresh loaf on hand and want to enjoy some toast at breakfast or brunch. Could even work for an afternoon tea! The strawberries I used were so ripe they were heavily fragrant and practically jam. Decadent! Enjoy with a pot of French press coffee and fresh-squeezed orange juice. Like eating a chocolate covered strawberry for breakfast! Marmalade is highly underrated. It is, however, very very sweet, and a little goes a long way, especially when you have sweeter blueberries, too. Mascarpone is a fancy Italian version of cream cheese. A toast to noble, yummy toast, and it’s unlimited versatility! 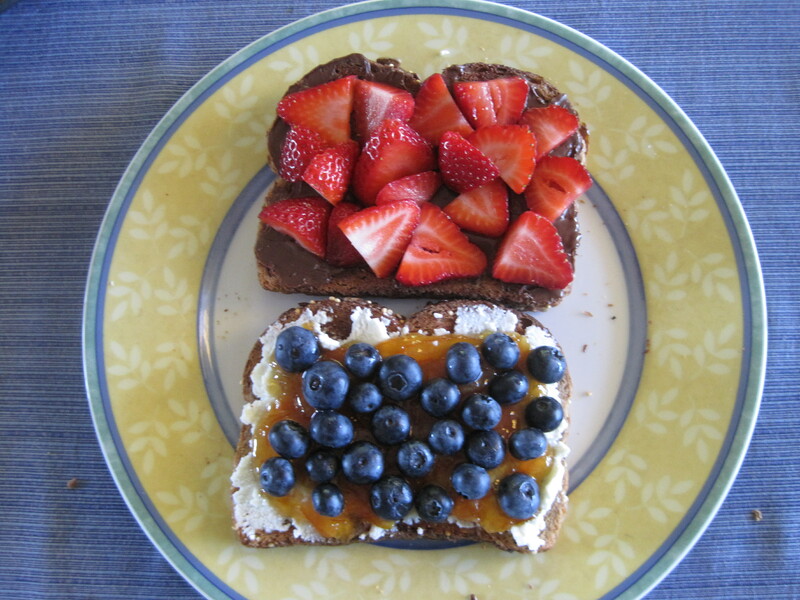 What are some other deliciously unusual ideas for toast? This entry was posted in $10 or under, Food, Food for Thought, Highly Recommended, Humor and tagged blueberries, breakfast, cooking, easy recipes, food, food for thought, gourmet food, humor, marmalade, nutella, recipes, snacks, strawberries, tea parties, toasts, writing by The Rambling Vine. Bookmark the permalink. oh, this looks absolutely yummy!